Scoliosis can not be cured. Scoliosis curves can be reduced and halted. If caught early scoliosis curves can be eliminated – Read More. How long will I require scoliosis treatment? Will Scoliosis treatment improve my balance? Correcting scoliosis begins with correcting the cervical (neck) part of the spine by restoring the normal curvature of the neck. In most scoliosis cases there is loss of curve or reverse curve in the neck. When normal curvature and structure are restored in this area, the brain is able to communicate more effectively to the rest of the body. As a result, balance and coordination are improved. What is a scoliosis Cobb Angle Measurement? The severity of scoliosis is understood by measuring the amount of abnormal curve in the spine. This measurement is referred to as the Cobb Angle Measurement. We find the angle measurement by drawing lines across specific areas of the x-ray and evaluate the curves. First we identify the first and last vertebras associated with the curve. A line is then drawn across the top, or superior, plate of the first vertebra in the curve, and a second line is drawn across the bottom, or inferior, plate of the last vertebra in the curve. Measuring the angle between the two lines gives the reading known as the Cobb Angle Measurement. Scoliometer is a proprietary name for a device used to measure the amount of curvature in a person’s spine. Will my scoliosis get worse as I age? Whether scoliosis develops earlier in life (Type A) or in adulthood (Type B), it will most likely progress; the only question is how fast. Additional studies have shown that as the Cobb angle increases, the amount of chronic pain increases, and range of motion and quality of life decreases. Can you help people with severe scoliosis? Although reductions in Cobb angles over 100 degrees have been achieved, reversing the course of any disease in its advanced stages is always more difficult. While stabilizing and correcting a 20° Cobb angle may take a month or two; correcting a 40°Cobb angle completely could take a year, or longer. As the Cobb angle increases, the time & effort required increases exponentially. Although scoliosis is commonly associated with pain, even in people without pain, the function of the heart & lungs is compromised. According to the National Scoliosis Foundation, scoliosis is associated with reduced life expectancy. On the average, people with scoliosis suffer a 14-year reduction in their life expectancy due to the strain upon the heart & the reduced amount of oxygen supplied to the body. Scoliosis is also associated with headaches, shortness of breath, digestive problems, chronic disease, and hip, knee, & leg pain. Will I be required to wear a brace with this treatment? The CLEAR Institute methodology of Scoliosis treatment does not rely on bracing. Research indicates that both rigid bracing and soft bracing have been shown to be ineffective in preventing the progression of scoliosis. A study published in the American Journal of Orthopedics found 60% of patients surveyed felt that bracing had handicapped their lives, and 14% felt it left a psychological scar. Am I too old to obtain scoliosis treatment? What is the timing involved with the Boot Camp Program? At South Florida Scoliosis Center we like to customize each plan to the individual patient. 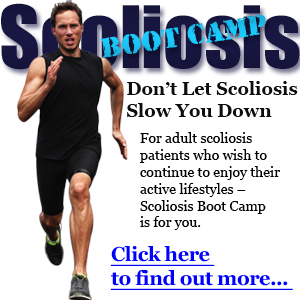 Scoliosis Boot Camp is usually a 1 week program. Read more. At South Florida Scoliosis Center we like to customize our plans to each individual patient. However click here for more information on some of our established programs. Do I have to be there every day? If the patient is a minor (below 18 years of age) SFSC requires parent/guardian consent to work with your child. If you’re a parent, and we have the necessary permission you do not need to be there everyday. If you are a patient attending one of our Intensive Care Programs, you will need to be there Monday through Friday for 2 sessions per day and will have homework assigned to be done on the weekend. Will I get the same results from the Boot Camp as I would with the 3 month program? Yes. You will get the same results from our Boot Camp Program as with the 3 month program. Our Bootcamp programs as well as our Intensives are designed with individuals with limited availability who wish to invest more time over a shorter period. How will I get the home equipment back to my country? Your equipment fits in a 36 inch duffel bag and along with a letter from SFSC stating the need for medical equipment it will be accepted by most airlines as a checked bag for no additional fees. Do I need to make special arrangements with the airport? At SFSC we provide our patients with a medical equipment letter to be presented to the airline. This letter is included in the 36 inch duffel bag which holds your equipment. We ask that patients call the airline to advise them you will be flying with medical equipment. Many airlines do not charge additionally for the medical equipment but circumstances vary from one airline to another. Can I do my regular exercise during the treatment program time? If you feel physically able to perform your normal workout routine after a Scoliosis session, then you are free to do so. Scoliosis workouts can be exhausting to some patients. Do you work with any local hotels? We do not get corporate discounts from any local hotels. However, the managers at both the local hotels below will afford our patients a 20% discount on their stay. At South Florida Scoliosis Center we look forward to being able to help you Stay Ahead of the Curve. Call our office at 305-705-0777 and speak with one of our team members regarding your health concerns and overall goals. We look forward to your visit.